Sometimes... no, most of the time, I don't want to do anything, so I was excited to find a developer teaming up with Sir Isaac Newton to create an application that encouraged my slothfulness. Previously, we showed you a way to turn off the Nexus 7 tablet easier, by using an invisible shortcut on the home screen instead of using the Power button on the side. But even that can be too much work. Sure, you can just set your Nexus 7 to fall asleep after a certain amount of time, but why even bother when gravity can do it for us? 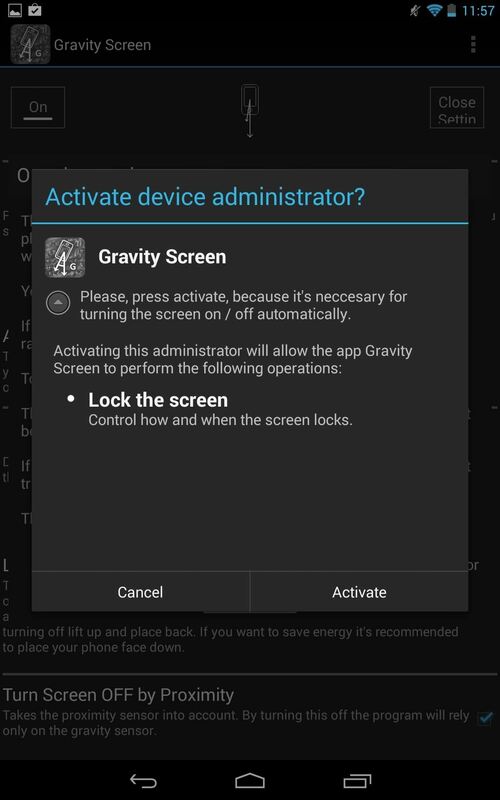 Android devs Plexnor created an app called Gravity Screen - On / Off, which uses the sensors in your tablet to detect certain angles and motion to turn the screen on and off. You can download either the free version or paid pro version of Gravity Screen on Google Play (more on the differences later). 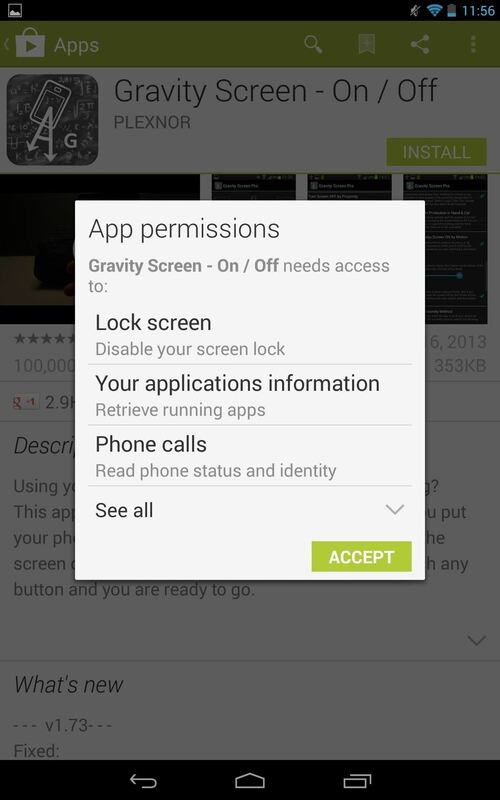 After you download it, an App Permission screen will pop up to inform you what this app needs access to in order to run. Select Accept. After you open the app, a second notification will pop up requesting that you give permission to activate the application. Select Activate. Assuming that you don't have pockets big enough to tuck your Nexus 7 into, enabling the Pocket Sensor option will allow the application to sense when your tablet is put away and will turn off the screen. Enabling the Table Sensor in the free app will let the app detect if your phone is angled at 10 degrees or less, and will then turn it off. If you have the Pro version, you can adjust the scale and have a more accurate sensor. Proximity sensors are basically used to detect if something like your face or finger are near the device. Disabling the Turn Screen Off Proximity option will make the device rely strictly on gravity sensors, meaning that when you take your phone out of your bag, it won't turn on automatically. The Alternative Proximity Method option will let you choose if you want the phone to lock or not every time the screen turns off. The Turn Screen On by Motion option will enable your device to stay on whenever it's in motion and faced upward, like in your hands. Set the Timeout scale anywhere up to 15 minutes to dictate how much idle time must elapse in order for your phone to decide it won't be turned on again with motion. With the pro version, you can set this scale for anywhere up to 16 hours. Setting the Sensitivity will allow you to pick how motion-sensitive the device will be. It's recommended to set a low sensitivity, in order to avoiding accidentally turning on the device. The above options are the biggest ones, but there a bunch of others you can try out. Vibration - Setting this on will make your device vibrate whenever it turns off. Using Your Headphones - Set this on if you like using your headphones with your Nexus 7. It will let your device know not to lock when headphones are connected, even when laying flat, resulting in your music being cut off. Disable the Screen Lock - Unless you're paranoid of others using your device, I would disable the screen lock. I don't feel like unlocking the device every time I pick it back up. Start to Boot - This is real important if you want the application to continue running every time your device restarts. The Notification option is extremely convenient and easy to overlook. When you enable this, a pause button will be set permanently to your Notification tray allowing you to pause the application directly from it. This comes in handy when your laying down your device for a good period of time and don't want the screen turning off. Just slide down your Notification tray and pause. If for some reason you don't like it, to fully uninstall, just open the Application Settings, scroll all the way down and select Uninstall in the bottom right corner. Way quicker than uninstalling via the App Manager. Thank you, Sir Isaac Newton, for making this application possible. I definitely find it useful and convenient. For me, the free version is perfect, but if you want more precision with some of the options, or 16 hours for timeout, the pro version might be your thing. Hopefully none of you run in to any issues with this application, but if you do, leave a comment and I'll try to help you out.